After we exclusively revealed the device just a few weeks ago, Garmin has gone official with the Vivosmart 3, its latest all-day fitness tracker and successor to the Vivosmart HR+. As you would expect, fitness is still a priority here, with the device marking Garmin's debut into the VO2 Max arena alongside the standard automatic exercise detection, rep counting and heart rate monitoring. The focus now also includes wellness, thanks to stress tracking, guided breathing and sleep monitoring. Unfortunately, though, GPS doesn't make the trip across from its predecessor, limiting the tracker as a running device for many. 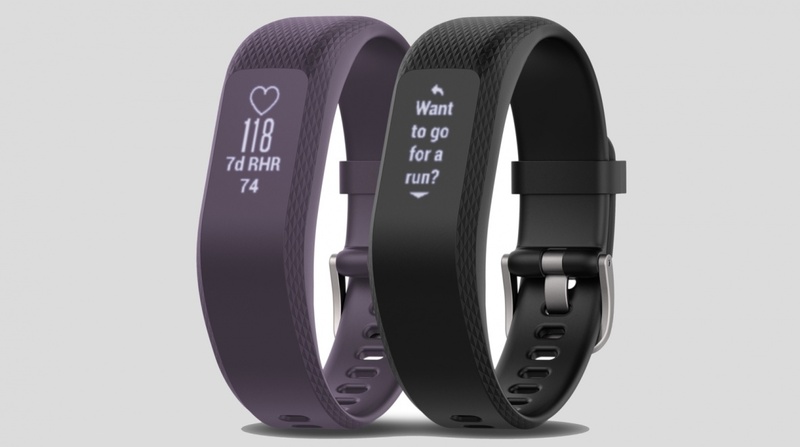 But what else does the Vivosmart 3 have in store? Read on to find out everything you need to know. As you may have already picked up, the Vivosmart 3's design is solid, but is by no means set to blow you away. The device sports a textured rubber band that offers a more unibody look than its siblings, also featuring a small black strip that houses the screen. And while this may not be the most attractive fitness band you can attach to your wrist, it's in the conversation for the most comfortable. This design also helps keep the tracker waterproof enough to join you on dips in the pool. In terms of specifics, the Vivosmart 3 will come with a thickness of 9.8mm and a width of 18.5mm, while also weighing around 21g. One crucial element to keep an eye on, of course, is which size you wind up choosing. With the Vivosmart 3, you'll have two options: small to medium and large. Whichever you opt for, you're locked in, so choose wisely. Following the subtle theme placed forward by the Vivosmart 3's band design, the monochrome screen also does its best to remain discreet. Its 'hidden display' will only come alive when alerts or notifications buzz, or if it's woken by a gesture. This is only a small screen, though, clocking in at 9.6 x 19.2 mm, and is also prone to smudges and dust. With this melding into the curved band, it's offering you a different proposition than the Garmin's Vivosmart HR+, which is a more fixed and discernible display coming in at 160 x 68 pixels. In comparison, the Vivosmart 3 will feature a 64 x 128 pixel screen. And in terms of what exactly will be popping up, the device supports notifications such as emails, texts and call IDs once paired with a smartphone. You can also control music playing from your smartphone via the tracker and there's a feature for remotely controlling a Garmin Virb action camera. While design can often be a sticking point with Garmin devices, features are where its trackers usually shine. Curiously, though, the Vivosmart is changing things up in this department by dropping built-in GPS and focusing more on day-to-day wellness by keeping tabs on stress – making it perhaps more suitable as a sequel to the Vivosmart HR. That doesn't mean you're missing out here completely, as plenty of features are still ready for you take advantage of, including a heart rate monitor, VO2 Max testing, automatic exercise tracking, Garmin's Move IQ and repetition counting for gym-goers. This is in addition to all the standard fitness metrics, which track steps, floors climbed, calories burned through the day and sleep through the night. During workouts, you'll be privy to Garmin's proprietary Elevate heart rate sensor for capturing heart rate variability, but this will also be taking snapshots through the day, giving you a readout of your resting heart rate on the tracker's screen. Heart rate is also integral to the new stress features Garmin has piled in. You'll be able to see your stress level at any moment of the day, and if it happens to be high, you can kick off a guided breathing exercise to re-centre yourself. Garmin's auto-tracking, meanwhile, will detect walking, running, swimming, cycling and elliptical workouts, which will then pop up in the Garmin Connect app. Speaking of which, all of your data automatically syncs to the companion, allowing you to review everything from stress levels and sleeping patterns to strength workouts and swimming activity. You can also make use of Garmin's Insights software that offers personalised recommendations and tips to stick to your goals. Garmin indicates that you'll receive five days of battery life with the Vivosmart 3, helped largely, we imagine, by the screen's hidden nature. We've yet to fully test out whether this holds up in everyday use and to what extent heavy tracking potentially brings this figure down, but since GPS is excluded from this outing, we expect it to remain consistent. After all, this is in the same ballpark as what is offered in both the Vivosmart HR and Vivosmart HR+, which we found to be on the money. While there's currently no solid release date for the Vivosmart 3, it's being listed at $139.99 and will ship this quarter – or, in real terms, over the next couple of months. It's not a massive revamp, but it should be enough to keep Fitbit, Misfit and company on their toes. And while it's more comparable to the Fitbit Charge 2 in terms of feature set, it'll also be competition for the Fitbit Alta HR, which too focuses on all-day, all-night wellness (though misses out on the guided breathing).